The lille bog “Kragehul Mose“ east or Assens on Funen was excavated very early. The first finds were the result of peat-digging and was reported by Søren Abildgaard (the father of the famous painted Nikolaj Abildgaard) in 1761. Items with runic inscriptions were uncovered, but are all sadly lost today. During the 1800's more stuff was found and in 1864-65 Conrad Engelhardt made an 40 square meter excavation (the rest had already been harvested by the peat diggers). Some important finds of weapons were unearthed and a few more in later 1870's diggings. Engelhardt's Kragehul Mose report is from page 157. It is interesting that the area was full of weapons (spears, swords and arrows, some in bundles) deliberately vertically pushed into the bog without any seemingly plan except for some spears that seemed to form a perimeter of the site. The bog was not excellent for preservation of iron since bog acid had attacked it. Most of the weapons were deliberately destroyed. Many spears has several hacks on the edges and most weapons were also bent. On page 162 is a picture of a sword half drawn from it's scabbard. He reports the recovery of 9 swords. All are double edged and all pattern welded. 30 wooden spear-shafts were decorated with patterns. 80 iron spears, 1 bow and numerous arrows were also recovered. 1) 150-200 AD: Very few items recovered. 2) 300 AD : Large deposit. 3) “Latest Roman Iron Age“ - 400 AD: Large deposit. The hourglass-formed hilts were from the 3rd deposit period, though it is unclear whether the cylinder formed hilts are from period 2 or 3? ek e͡rila͡z asugisalas m͡uh͡a h͡aite g͡ag͡ag͡a ginu g͡ah͡e ... lija ... hagala wiju big- . “I Asgisl's “Eril“ called Muha“. The latter part is way more tricky to translate: “g͡ag͡ag͡a ginu g͡ah͡e ... lija ... hagala wiju big-“ . One of the more cool inscription. Certainly a lot of sacred focus in that spear. Forgot to add that a recent book about the finds was released in 2010, by the Archaeological Society of Jutland. 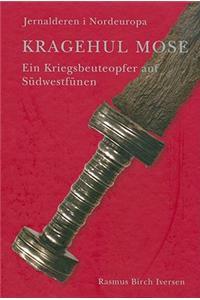 It is in German with an English summery: I do not own it, but it should contain pictures of the swords (at least the front page does). I can confirm that the recent publication includes photographs and line drawings of all of the swords, scabbard elements, spears, shield fittings etc from the Kragehul excavations. The English summary is 10 pages long and enough to allow the book to be easily usable for those who struggle with German. It is one of many recent publications relating to the Danish bog deposits, published as part of the 'Järnålder i Nordeuropa' project. I've taken a lot of pictures of bog finds from the various museums, if you're interested. That would be great to see some of these picture. Many of the finds are on exhibition in local museums, so it takes some effort to get a good picture collection. Nice to get confirmed that the recent publication have good description of the finds with both pictures and drawings. I assume that the pictures I gave the link to from the Danish National Museum might be the same used in this publication, or do they differ?